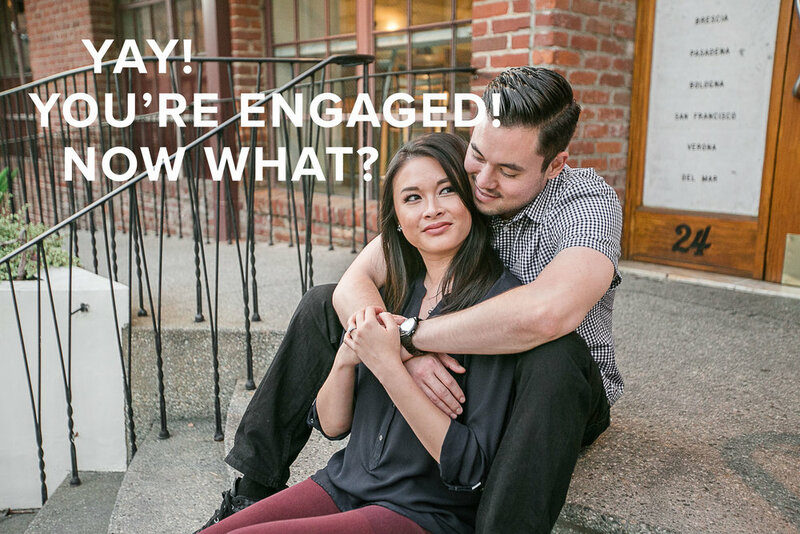 He/She popped the question and you excitedly said yes! Hooray for engaged life! But what are you supposed to do next? Other than call your mom, I can help answer that question. Step 1. Scream it from the Mountain tops! AS tempting as it is in our super digital world to just post the announcement right away to Facebook or Instagram, a lot of family members may be a little bummed if you decide to let everyone know this way. SO my recommendation is to grab your phone, and start calling/texting all the fam bam. Maybe even get your mom or sister can join in on calling everyone, just to help get the news out faster. Once you get through your phone's address book, post away! Even the most diligent fiancé may get your ring size wrong, and that is totally ok. BUT absolutely get that baby sized to fit you perfectly. There is nothing sadder than hearing stories of rings lost. AND I 100% recommend getting your ring insured. If you have rental/home insurance it is pretty easy to add to your policy. Losing your one of a kind ring and getting it replaced may be difficult, but with no insurance to help replace said ring, you may end up in double doodie. Step 3. When's the Party? Deciding your date can be intimidating, but this is the #1 question people (friends, family, everyone) will ask you. It'll save you lots of headaches if you both come up with a vague-yet-specific answer, a time of year, something like"next spring is the plan " or "WE love the autumn, so next fall it is". Friends and family love to feel like they're in the loop, and they'll also mentally keep those travel plans in mind. AND added bonus, it helps give some direction to your wedding planning and venue search. Before you get crazy and start locking down when and where the wedding will be, you should figure out your budget. Use a super helpful budget break down, you can find one in Pinterest or Google. And start talking to the parentals to see if they'll be contributing, but for sure start your own wedding savings account to save for yourselves.The perfect part about a budget planner is you put in a total amount you want to spend, and it helps you get a good guide of how much budget you have for each piece of your wedding. Even a small wedding will need a great plan! Start reading bridal blogs, buy a few wedding magazines, and create your dream wedding Pinterest board. If you haven't been mentally planning your wedding since you were a kid, don't stress. I didn't, and my wedding turned out great. But it does help with the rest of your research if you have a way of determining what you like and don't like. Get creative, explore a lot and try not to get to caught up with what is trendy. Get going! I 100% think that it's a good idea to book your wedding reception site (and wedding ceremony site potentially too) as soon as possible once you're engaged. And I would say to try to book a spot sometime between a year to nine months ahead of the wedding at least. A lot of popular spots book up quickly, especially during high season (summer into fall). And the longer you wait, the more flexible about the day you get married to get the site you want, you'll need to be. Or maybe talk to a friend who has a big backyard. Ultimately, it's all about what you want and what makes the most sense to the two of you. Step 7. Get some help! After finding your venue, I think the next big decision should be deciding on a photographer and/or a Wedding Planner. I know I know, I'm biased but these two vendors are the people who will be with and be by your side every step of the way, just as much or more than your bridal party. And they usually have a huge arsenal of amazing vendors they've worked with and trust, and can provide a lot of insight and guidance. Whether it's a day of or full coordinator, these champions of the industry are your trusted right hand. They will help coordinate all the wedding crew. And your photographer has the all important task of telling your love story, and recording those memories for you and your family to look back on forever. And just speaking for me, a lot of times I step in and help in many parts of the wedding that aren't photo related. So I think the most important factor in choosing both of them is trust and friendship. Can you relate to this person and see them as someone you would want to be friends with? Because it makes a world of difference when your wedding crew is just as excited as you are for your big day, and isn't just there to do a job! And my number one piece of advice when hiring a vendor is never ever let someone make you feel bad for not choosing them or force you into making a decision. And if they do, they are not the vendor for you. PERIOD. They're a bully and don't deserve your business. OK that's all the advice I'm going to give for now, I have lots more in my advice fanny pack, but I'll give it a break since you've already done so much reading today! AND I am sure your friends and family have giving you tons of unsolicited advice, but I am also here for you if you need me! So reach out, let me know if you need anything, I'd be thrilled.